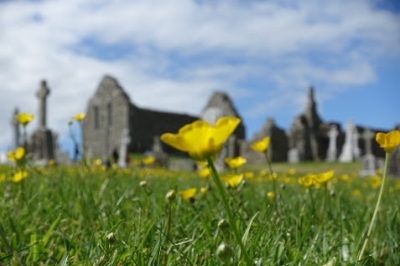 The Monastic City of Clonmacnoise and its Cultural Landscape is part of the Tentative list of Ireland in order to qualify for inclusion in the World Heritage List. If you are looking for the Irish monastery ruin, then Clonmacnoise is probably what you are looking for. The lovely ruins are situated along the banks of the Shannon river near the very center of Ireland. The location chosen was at the time a key trading hub with several trade routes crossing, so the monastery was well positioned to spread Christianity in Ireland. Founded in the 6th century, it reached its largest expansion in the 12th century. The many remains still visible today give a good impression of the size and wealth of the monastery in medieval times. The wealth also led to a long line of raiders attacking and ransacking the place, first Vikings, next Normans and then English. It’s final demise came at the hand of Cromwell’s forces in the 17th century when it and hundreds of other Irish monasteries were destroyed and never rebuilt. The site is quite popular with organized tours. As a German I involuntarily joined multiple guided tours in my native language. It also features a museum providing context and showing a few of the high crosses to protect them from the harsh Irish climate. To me there is little doubt that this should be inscribed. This is the quintessential Irish monastery ruin. Only issue I would see is how this relates to the other Irish monastery nomination, the Early Medieval Monastic Sites: Clonmacnoise is the very definition of an early medieval monastic site. One solution would be to combine the two nominations. The other option would be to advance the best of these sites which Clonmacnoise clearly is. But as it stands the Irish seem to have no plans to advance any sites on their tentative list. Clonmacnoise features on many tourist routes for Ireland. Plenty of trips to the west coast will include this as a stop. You can even visit as day trip from Dublin by joining an organized tour. We came by car from Athlone where we had stayed for the night. For some strange reason the area is really expensive when it comes to hotels and there aren’t that many to begin with. We also should have turned on the navigation app as we missed the proper exit and took a 20min detour. The public transport options are limited. Clonmacnoise nowadays is a rather remote place. The only option I found is to take a boat from Athlone.